The majority of women in Oman are covered from head to toe in black, sometimes even with their faces covered. Apparently it is cultural attire rather than religious. 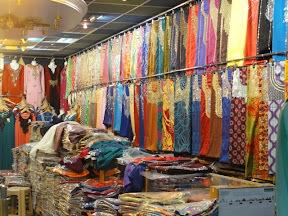 I've been wondering for days what they actually wear under their black robes, particularly when all the fabrics stores that we saw in the souq were full of bright colours. According to our guide they could be wearing anything from shorts to miniskirts to jeans. Apparently the average age women get married is 23 to 25 (older for men). They don't do arranged marriages and women are encouraged to work, even after getting married. It is expensive for the man when they get married. He has to pay the brides family 5000 rial (A$15,000) then he has to buy her 1000 - 3000 rial in gold/jewellery, all this while the average income is 7000 rial (A$20,000). Both girls and boys go to school (free). It is co-ed until year 6, then the girls and boys are separated for high school, then at college/university they are back together. I often get stared at being a foreigner in this country (and not covered from head to toe) but sometimes I am invisible because I am a women. When checking into hotels, they always speak to Kane, even though I have all of the documents etc. At breakfast the other day, I walked into the restaurant ahead of Kane. The waiter said hello to me but waited for Kane to ask what room we were in. Takes a bit of getting used to.